The pressing social need for appreciation and acknowledgment has catapulted Mark Zuckerberg in the league of billionaires. Irrespective of gender age and nationalities, we are suckers for compliments; some more, some less. Massage does wonders and if it’s an ego massage; even better. However, appreciation and flattery are as different as chalk and cheese. Appreciation without expecting any favor is genuine. But to appreciate someone in lieu of a favor or to remain in good books is flattery. Appreciation is sincere but flattery is not. Both appreciation and flattery come in handy when one desperately needs to impress the opposite gender. I am sure it is easy to melt someone with, ‘Don’t wear makeup, you are messing with perfection; I bet the wind blows just to know how gorgeous your hair is; there isn’t a word in the dictionary for how good you look or you take my breath away’. Politics and flattery go hand in hand. Decades ago a Congress sycophant had said, “Indira is India and India is Indira.” Nothing has changed. Recently the UP Congress committee had released a poster of a heavily bejeweled Rahul baba striking a pose as Lord Krishna astride a chariot in a giant hoarding. No points for guessing who took umbrage. Forgetting the fact that in 2008, Advani was dressed as lord Ram in a poster aiming his arrows at twin vultures - Sonia Gandhi and Manmohan Singh. Clearly in politics, social arrangements work in perfect tandem with the aid of ample amounts of grease and butter. Remember the thousand rupee note garland in Mayas neck? While the flatterer and the flattered were pleased, they forgot that the public was nauseated with blatant sickophancy.. The art of flattery flourishes in the film industry. When one is constantly fed with, ‘you look so young and handsome,’ the result is a seventy five year old Dharmendra donning a flamingo colored shirt and gyrating with skimpily clad women in his latest movie. And a pouting Shekhar Suman is seen displaying his shiny cleavage a la Parmeshwar Godrej. Fortunately, now on most occasions, work speaks for itself. On others, maska is lagaoed covertly. I am referring to the normal office life here. In deals where huge orders are at stake, innocent flattery transforms into a more hideous bribery. What’s most important is self appreciation and acceptance of who you are as a person. 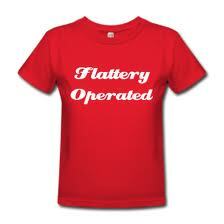 To covertly flatter is human but to get overtly flattered has its pitfalls. its subjective.. depends from person to person.. if someone has inferiority complex he/she might take the genuine compliments delivered at door steps from a unknown-who definitely will not expect favors, to be flatterer too. that my pov.. u may ignore it. I think the negative comments would never make way to the comments section because people either praise or keep mum...no one like to blurt out the odds,isn't it? What you put in the last is so true: self appreciation and acceptance of who you are! Thats right. Appreciation and flattery can be very easily differentiated. Anyone can see through such farce but people will still attempt it, no matter what. Yes i quite agree with what u have said, especially last 3-4 lines. Nice post expressing the 'hard fact'.True ,even I wouldn't appreciate a negative comment on me;however "optimistic"you may be,you would definetely feel a pinch with the negative comment.I also defintely don't get carried away with flattery too;I usually judge a person's attitude and intentions by his/her words. i have lost friends thanks to sarcastic comments that i sometime leave on fb status and pics. @Deepika...Yes, its subjective and differs for different individuals. Appreciation however is a social need to keep the social arrangements in working order. @Aditya...I guess its an imperative social need. @Blasphemous Aesthete...It starts with giving flowers to your fav teacher. That's innocent. But then it moves on to CCgiri or maska lagana. @Harish...That's unfortunate. It takes a lot of confidence and maturity to accept criticism. Feel free to voice your disagreement on this blog. I will try to take it on the chin. @sritatsat.. People with self confidence and self-esteem follow their convictions. Ideal situation is when your office environment supports meritocracy and not chamchagiri.And if flattery flourishes in the work environment then good people move on in search of real recognition. Yes, self acceptance comes before social acceptance. Absolutely.I also agree that in pvt sector, mithai business has stopped. But, sycophancy in politics will never end.The dynastic system of rule will encourage sycophancy. hummmmmmmmmm nice red color t-shirt!! i hv also one red one .... bt i really need tht one becoz its look nice! @BK Chowla....Sycophancy is prevalent even in political parties without dynasty system.. MPs regularly come and touch Jayalalithas feet. Thank you for taking time to read the post. Who doesn't love compliments...the trick is to be able to sift out the genuine ones. @Purba....Yes, indeed. The need to be appreciated and socially accepted has made Mark Zuckerberg a billionare. Nicely put. Appreciation, I believe comes from rational understanding of other/other's work. Rationality is the only proper way in which one should deal with oneself as well as others, but it seldom happens which is the greatest tragedy. In rational society, flattery won't exist. Ha Ha...So true..Sometimes even the genuine comments are treated flattery and chamchi types! And in today's polical world, only one who makes flattery comments survive! You have spoken about Flattery in all walks of life.. but you forgot one..
Am sure you must have come across people who post 'awesome' comments just to get a few footfalls on their dying blog! I hate it..the facade amongst bloggers. What do you think? 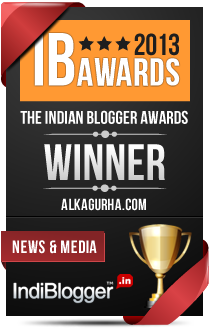 @Vaish....Appreciate your spending time on my blog. @S....That was constantly playing on my mind while writing the post. I was timid enough to avoid touching a raw nerve. Its difficult fr ppl to take in criticism and takes a lot of courage (& intelligence) to have a good laugh at urself... Those are the ones that like flattery more than genuine appreciation. Gosh, Alka, well written. Impressive is the word. You've kinduv nailed it by a large measure. Especially when you said even an innocent or perhaps a genuine compliment maybe in todays time be subject to suspicion. 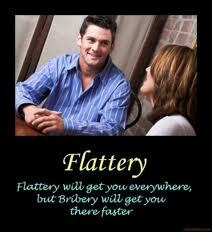 Whatever happened to the age old adage - "Flattery will get you anywhere" used by the promiscuous or not. Personally, i loved your write up and am not here to argue with anyone. Everyone is entitled to their opinion. I leave mine here. Adios, till I get impressed again. @lioness...love your name. I am a Leo too, by my birth sign. Appreciate your spending time on the blog. It is also common when asked 'How are you' for which you get prompt reply 'Good'! The point to be noted while getting compliments is the tone of voice. I have always been alert to it and so know 'chalk from cheese' as you put it. I can't comment on social networking sites since I am not part of it. But yes,even there, I am sure you can sift out the genuine from the phoney ones. To give in to flattery is to give up reason. Nice post. thanks for sharing!